The cover of the first English DVD compilation released by Geneon Universal Entertainment. An anime adaptation of the Higurashi no Naku Koro ni visual novel series was announced by 07th Expansion and animated by Studio DEEN. The series contained twenty-six episodes, which aired between April 4th and September 26th, on a number of Japanese television networks, including but not limited to, Chiba TV, Kansai TV, and Tokai TV. The series is divided into six chapters, which are the first six chapters in the original visual novel series. First is Onikakushi-hen between episodes one and four, followed by Watanagashi-hen between episodes five and eight, and Tatarigoroshi-hen between episodes nine and thirteen, making the series half over. Next is Himatsubushi-hen between episodes fourteen and fifteen, making it the smallest of the story arcs. The last two chapters are Meakashi-hen, between episodes sixteen and twenty-one, and finally Tsumihoroboshi-hen, between episodes twenty-two and twenty-six. Keiichi is the main protagonist in the first three "question" arcs. The son of a famous artist, his family recently moved to Hinamizawa after a violent incident event involving him in their hometown. His charisma and remarkable talent for rhetoric, which earns him the nickname "Magician of Words," allow him to easily make new friends and become popular in the village, not to mention win some of the club activities. Early in the story, in the Onikakushi-hen arc, he is affected by paranoia and driven to commit murder; however, the inner strength and unshaken belief in his friends he acquires in the other arcs are one of the keys to solving the mystery. Eventually, he is even able to recall some of the events of the past repetitions. When he is in need of a weapon, he wields Satoshi's old baseball bat. It is later revealed in the story that before arriving at Hinamizawa, he grew weary of school, due to his ostracism from having a genius level intelligence, and was the perpetrator of a series of crimes involving shooting children with a BB gun. Keiichi has also demonstrated instances which suggest that he harbours certain romantic feelings for Mion Sonozaki. Rena is a girl in the same grade level as Keiichi and the main female protagonist of the question arcs. She is very kind and takes care of Keiichi whenever possible, but is also naïve and is usually subject to light teasing by Keiichi. She is distinguished by her obsession with things she perceives as adorable, calling them kāii (かぁいい?, a slurred form of kawaii (かわいい? ), meaning "cute"), which are usually moekko characters or items she finds while scouring the local dump. Whenever she sees something that grabs her attention, she proclaims "I'm gonna take it home!" (お持ち帰り〜, Omochikaerī?) and proceeds to try and do so, becoming virtually unstoppable during these intervals. She also utters the phrase haū (はぅ〜?) when excited or flustered, and has a habit of repeating phrases at the ends of her sentences, most famously kana? kana? (かな? かな? ?, lit. "I wonder, I wonder?"). This is also an onomatopoeia of the sound that higurashi cicadas make. Rena's real name is Reina (礼奈? ), a name she used normally before she moved from Hinamizawa to Ibaraki with her parents one year prior to the events of the story. There she discovered her mother having an affair, causing Reina to smash all the windows in her new school and assault three male students with a metal bat under the influence of the Hinamizawa syndrome. Believing herself to be cursed by Oyashiro for leaving Hinamizawa, Reina returned to the village with her father shortly after the incident and changed her name to "Rena" out of shame of her parents' subsequent divorce. So as not to alarm Keiichi, Rena claims to be a relative newcomer to Hinamizawa herself. Because of the incident, Rena is sensitive about the topic of Oyashiro, believing strongly in the existence of the deity and the curse, and becoming angry and unstable whenever anyone questions it. Her weapon of choice is a large cleaver borrowed from her tool shed (the dump in the anime). Mion is the oldest kid in Keiichi's class. As the elder, she is the class president and everyone looks up to her as the leader. Her social skills are on par with Keiichi, whom she highly respects as a friend and rival (though it is later shown that she is in love with him). She acts like a tomboy, and calls herself oji-san (meaning old man), but has a hidden girlish side. She is next in line to be the head of the Sonozaki household, one of the Three Families which holds tremendous influence in Hinamizawa. She is often seen with a holstered airsoft gun, even though she is never seen using it, and was removed in the PS2 adaption of the game; she is, however, very adept in the use of martial arts. She is notable as the only character that has never been driven to the extreme paranoia that causes the others to kill in the question arcs and the first two answer arcs. Her real name is actually Shion, as she was born second to the family, but due to sister swapping even at a young age, she was mistakenly taken as Mion and branded with the oni tattoo, ultimately causing her to stay as Mion. Mion also serves as leader of the after-school club consisting entirely of the main characters. She organizes a variety of strategy-based games for the members to play with penalties for any losers. Penalties usually involve wearing embarrassing or frilly outfits on the way home. Each game she organizes involves bending the general rules or using questionable and crude methods to win such as playing cards with a marked deck or using feminine wiles to discourage opposition. Shion is Mion's identical twin sister, who currently resides in Okinomiya. In spite of their externally different personalities, she and Mion often switch places, and it can be difficult to distinguish between them. It is noted by Rena that, although externally the twins are very different, on the inside, they are really the same. Their first switch took place when they were little. Right before tattooing the symbol of an demon/oni, which is reserved for the older sister, she was mistakenly identified as Shion, the younger sister, which means that she was actually born as Mion Sonozaki, the older sister. Since then, she switched her identity of Mion with Shion, the younger sister. This initial switch is only mentioned in the sound novel and manga, but not the anime. She was sent by the Sonozaki family to a private boarding school, named St Lucia, but escaped and returned to live near her hometown, where she lives with Kasai. In spite of all this, she and Mion maintain a close relationship. In most of the arcs, she is at a different school from the other main characters, and therefore appears less frequently. She was in love with Satoshi, and blames the Three Families of Hinamizawa for his disappearance in Watanagashi-hen and Meakashi-hen (the latter told from her point of view). In the anime, she is required to perform a "Distinction of Right and Wrong," a ritual of self-mutiliation to pluck out three fingernails in front of witnesses in order to purge her 'sin', believeing that doing so will cause Satoshi to be spared, an event personally overseen by Mion, which drastically strains their relationship. This, along with a demonic alter-ego she manifested in her grief, eventually drives her to mass murder, which led her previously latent paranoid schizophrenia to eventually develop into a full-on psychosis. One of the last words that they exchanged before he disappeared was a promise to take care of Satoko. In Watanagashi-hen and, more explicitly, Meakashi-hen, her resentment toward Satoko for her role in his disappearance causes her to forget this promise and murder her, only to remember too late; however, in subsequent arcs, she has taken the promise to heart to the point where she is willing to give up her life for Satoko. In Meakashi-hen, she is shown to be delusional to a point beyond the other characters (with the arguable exception of Rena), as she repeatedly deludes, among other things, that she sees Satoshi after his disappearance. She works as a waitress at the Angel-Mort restaurant and is the manager's assistant for the Hinamizawa Fighters little league team. She is often seen carrying a taser, which she'd use in emergency situations, and also wears a yellow ribbon in her hair. She is also shown to be good with guns, along with Kasai, in Matsuribayashi-hen. Satoko is a younger classmate in Keiichi's school. She has a distinctive style of speech, ending all of her sentences with ~wa, and is known for her boastful laugh. In spite of her young age, she seems to have an impressive arm strength and is quite clever in setting up traps, and likes to practice on Keiichi. Although her personality is quite energetic and mischievous during the events of the games, Satoko's past was full of trauma; she shoved her parents down a cliff because she was paranoid, caused by the Hinamizawa Syndrome, and she was abused by her foster parents (her aunt and uncle), and her beloved brother Satoshi disappeared. And in Matsuribayashi-hen, Irie suggested she killed her parents because she thought they would kill her, and so to her it was an act of self-defense. She was suffering from the Hinamizawa Syndrome at that time, and though Takano wanted to dissect her alive for study, Irie fought to save her life. She is one of the few characters to ever recover from Level 5 of the Syndrome, but has to take shots on a regular basis. Though she greatly misses Satoshi, and feels that by being strong he will return, she comes to regard Keiichi as her new "nii-nii" (にーにー?, a cute term for "older brother"), and once even regards Shion as "nee-nee" (ねーねー?, a cute term for "older sister"). She dislikes kabocha, and confuses cauliflower with broccoli. Rika is the main character in Minagoroshi-hen. She is a younger classmate in Keiichi's school, and is in the same grade level as Satoko. Naturally, she is great friends with her, as they live together in the same house. She is revered by the villagers as the heir of the local shrine, and plays the role of a miko in the annual Watanagashi Festival. She has been the head of the Furude house since her parents died, but rarely attends town meetings due to her young age. While she does speak in normal context, she likes to say nonsense words such as mii (みぃ〜?) and nipah (にぱ〜?) and often ends her sentences with nano desu (〜なのです?, lit. "it is so"), which inflame Rena's passion for cute things. She also likes to describe events using sound effects, such as "The cat was going 'nya nya' and 'scritch scritch'" or saying "Clap! Clap! Clap!" when clapping her hands. In reality, she is being reborn in a 'new world' at some random time before or during June 1983, and in most of the worlds she is the only one to remember the previous lives. She believes she has lived over 100 years by the time of Tsumihoroboshi-hen, but continues to act like a child in order not to alarm her friends. Prior to Matsuribayashi-hen, she is the only one able to see Hanyu, who has been an "imaginary friend" to her all her life. Despite her young appearance, she seems to be quite fond of wine, as well as kimchi, which she uses to silence Hanyu when Rika is in a bad mood; this works because both Hanyu and Rika's senses are linked together, though this seems to be redundant by Matsuribayashi-hen, possibly because of Hanyu's coming into the world. It is later revealed that Rika's death would cause an outbreak in Hinamizawa which everyone would go on a rampage of hysteria. Further on, she attempts to stop Takano from her killing spree by pulling her friends and others around her together. Hanyu is the mysterious "transfer student" in Matsuribayashi-hen. She has a pair of dark colored horns on her head, one of which is chipped slightly. In the original sound novels, they are mentioned by Keiichi, who mistook them for toys, but after noticing that Hanyu was sensitive about them, he apologizes and the club members assure her there is nothing wrong with them. However in the anime, no one seems to notice or mention them, with the exception of Takano, who calls her a "monster". She has appeared to Rika all her life, but only in Matsuribayashi-hen and Miotsukushi-hen did she gain the power to interact with others, posing as a distant relative of Rika's and given the name "Hanyu Furude." Like many of the characters, she can be frightening when angered, and with her spirit-like nature, her appearance can change with her mood until she takes a physical form. She is the one responsible for the eternally repeating June 1983, which she created in order to save Rika from being murdered. She is also responsible for the "footstep you hear after you stop walking," "feeling of being watched as you sleep," and hearing "I'm sorry" when no one is around or says it, which causes the characters to have severe paranoia. She follows around the characters, repeatedly apologizing for not being able to change their fate. She is very meek and often makes the noise "Au au, au au…" when she is nervous or uncomfortable, or sometimes while trying to make a point. She tends to end her sentences with nano desu (なのです?, lit. "it is so"). She dislikes alcohol and kimchi, which Rika imbibes in large amounts as punishment when she finds Hanyu annoying (as Hanyu and Rika's senses are linked together until Hanyu takes physical form). She mentions that she is a "being above humans" after being sacrificed to atone for the sin of humans, while both Rika and Takano describe her as a kind of deity. Rika refers to her as "Oyashiro" when talking with others (evident from Shion's chat with Rika in Meakashi-hen) but does not personally think of her as Oyashiro; instead, she sees her as a close friend. 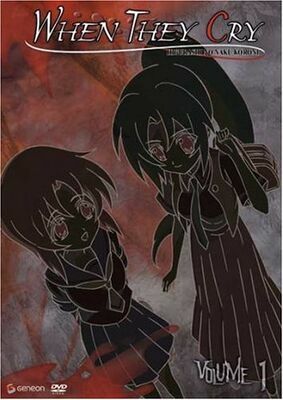 In Higurashi no Naku Koro ni Rei, Hanyu tells Rika that she was sacrificed to atone for the sins of the people of the village, and Hanyu asked Ōka Furude (古手 桜花, Furude Ōka?) (Hanyu's own daughter and Rika's ancestor, who appears physically almost identical to Rika) to kill her and then make the village a better place. In the DS-exclusive arc, Kotohogushi-hen, it was revealed that Hanyu's real name was Hainiryuun Ieasomuuru Jieda, and that she had a child, Ōka, with the Shinto Priest Riku Furude. Satoshi is the older brother of Satoko Houjou. Although he is currently missing, his past influence is the key to the actions of several characters in Higurashi. Keiichi is often compared to Satoshi by other characters, as the two have certain physical similarities, and, in some arcs, display the same odd behavior and paranoia. Like Satoko, he cannot distinguish the difference between cauliflower and broccoli. Satoshi is referred to by Satoko as nii-nii, a childish form of the Japanese word ani (兄?, meaning older brother). According to the TIPS in Meakashi-hen, he was last seen at a Nagoya train station boarding a Shinkansen bound for Tokyo. This was revealed prior to the start of Matsuribayashi-hen to be a result of him trying to run away from home due to his abuse, only to change his mind a few moments later. While it is suggested that he may have witnessed his aunt's death in the games, in the anime, Satoshi is implied to have killed her or was so disturbed that he believed he did. Combined with the stress of taking care of Satoko and the murder, he succumbs to Hinamizawa Syndrome. In Matsuribayashi-hen and Miotsukushi-hen, it is revealed that Doctor Irie put him under heavy sedation in the underground parts of the clinic. Always referred to as Oyashiro-sama, he is a deity observed in Hinamizawa and seems to be rather violent and brutal; his sacred shrine is full of ancient torture equipment. Legend says that Oyashiro brought peace between the villagers of Onigafuchi (Lit. Demon's abyss), the former name of Hinamizawa, and the demons that spouted from the Onigafuchi Marsh. The actual existence of Oyashiro is something of debate, some can see Oyashiro as the simple "perception" of a god. However, those who experience extreme paranoia (Keiichi, Shion, and Rena in perspective chapters) refer to Oyashiro as the "footsteps you hear when you stop walking" and felt like you were always "being watched". Kuraudo Ooishi is a veteran police investigator at Okinomiya who has vowed to solve the mystery of the Hinamizawa murders before his retirement, to avenge the first victim who he was friends with. Due to his uncouth tactics and the lengths that he goes to in order to solve the mystery, he is looked upon as a nuisance by the villagers, especially the Sonozaki family. He approaches one of the main characters to become his informant in several arcs, and is sometimes unwittingly responsible for triggering their paranoia. However, he plays an integral role in aiding the protagonists during the last two answer arcs, Matsuribayashi-hen and Minagoroshi-hen. Jirou Tomitake is a freelance photographer who occasionally visits Hinamizawa (Around three times every year). He gets along well with Miyo Takano, because of their similar interests in photography. Despite being only an occasional visitor, he seems to know a fair amount about Hinamizawa's past (Specifically the Hinamizawa murders). Ooishi and the police are suspicious of his true identity. In the first six arcs, he is consistently found dead of suicide (clawing his throat out) on the night of Watanagashi, triggering many of the events that follow. It is revealed later, however, that he was actually murdered by Miyo, who gives him an injection of the H173 drug, produced in the process of developing a cure for the Hinamizawa Syndrome, but has the exact opposite effect (incurring the symptoms of the disease instead). Jirou is revealed in Minagoroshi-hen to be an officer working on the Hinamizawa Syndrome, together with Miyo Takano and Kyosuke Irie, and is but merely posing as a photographer. Miyo is a nurse at the village clinic. She has taken a keen interest in Hinamizawa's past and culture, recording all her speculation in notebooks. At times, her storytelling can be very mysterious and chilling—she seems to enjoy putting people on edge. In the first six arcs, she consistently disappears on the night of Watanagashi, and an incinerated body thought to be hers is found in the mountains (and the autopsy report states that she actually died the day before the festival). Miyo is the person who kills Rika, leaving her body and scattered organs out for the crows to eat. It is shown that following the death of her parents when she was a child, she was sent to an orphanage, where she and other children were regularly abused. Eventually, she calls Hifumi Takano's (her father's former professor) number for help and is saved by him after she and her friends attempt to escape. In the manga, they further detail what happens to her and her friends when they try to run away. She calls Hifumi, but is caught and then is forced to watch her friends undergo strange types of torture. They try to torture her as well, but Hifumi eventually saves her. Her original name is Miyoko Tanashi (田無 美代子, Tanashi Miyoko? ), but she changed it when she was adopted by Hifumi Takano. Hifumi was the one who started Miyo on the path of medicine with his study of the Hinamizawa Syndrome. Her gratitude to her adoptive grandfather is what motivates her to kill Rika, as the scientific community mocked Hifumi's work on parasites, and the release of the Hinamizawa parasite would vindicate his research. Kyosuke is the head doctor of the village clinic. Despite his young age and the fact that he has a severe maid fetish, he is highly respected in the community. He cheerfully makes house calls and seems to truly care about everyone's health. He has (half-jokingly) admitted that he wishes to marry Satoko when she is older, but is not above chasing after Rika when she is wearing one of the uniforms from the restaurant Angel Mort. In addition, he is the manager of the village's baseball little league team, the Hinamizawa Fighters. In the past, he has performed lobotomies without consent, which led to him being banished from the medical academic society in Tokyo. He is recruited by Takano to direct research the Hinamizawa Syndrome, which he feels will redeem himself. It is later revealed that he works under Miyo in research, where he is trying to find a cure for Hinamizawa Syndrome, while not knowing of his employer's true desires. Rumiko is the female teacher of Keiichi's class, who is a parody character of Tsukihime's Ciel (permission for her usage was given by Type-Moon). The voice actress for her character in the anime series is the same as the voice actress of Ciel from the Tsukihime anime. Going along with the parody, her favorite food is curry rice, just like Ciel, and she will react violently when anyone insults it. Also, in the comedic chapter Batsukoishi-hen, she is shown wielding six small wooden boards in the same fashion that Ciel wields her "Black Keys" swords. Mamoru is the main character in Himatsubushi-hen. He is a young police investigator at the Metropolitan Police Department in Tokyo. He befriended Rika while investigating a case in Hinamizawa four years ago, all due to a prophecy about his wife which came true, though he just brushed it off as coincidence. In an untold world, Mamoru regrets being unable to save his wife and Rika, and learns martial arts to clear his mind, hoping to relive the time before Himatsubushi-hen to save them. Through a miracle, Mamoru inherits his martial art skills in Matsuribayashi-hen, using them to single-handedly defeat a Yamainu squad, and decides to save Rika from her destined death as a payment for saving his wife through her prophecy. Tatsuyoshi is an employee of the Sonozaki family, who looks like a secret agent. He was more active in the past, but has settled down to become Shion's caretaker. He somehow knows both Teppei and Rina, and is aware of their lifestyles and badgering tactics. In Matsuribayashi-hen, he displays extreme strength and combat experience while raiding the Irie Clinic, frequently subduing members of the Yamainu. Teppei is Satoko and Satoshi's uncle/foster father. He and his wife were forced to take care of Satoko and Satoshi after the death of their parents, but they abused them. He currently lives in Okinomiya. According to Kasai, he is a pimp and uses his lover Rina to swindle men out of their money. He is killed by Keiichi in Tatarigoroshi-hen to protect Satoko, and by Rena in Tsumihoroboshi-hen when he tries to blackmail her father. Shion contemplates killing him in Minagoroshi-hen to protect Satoko, but Keiichi stops her before she can make the same mistake. Satoko and Satoshi's aunt/foster mother. She was beaten to death on the night of last year's Watanagashi Festival, causing Teppei to flee Hinamizawa. A drug addict was charged with her murder, but various characters suspect that Satoshi was the true murderer, which he either was, or deluded himself to think he was. Oryō is Mion and Shion's grandmother and head of the Sonozaki household. She appears to be a very harsh old woman and is considered the most powerful person in Hinamizawa. Both Mion and Shion call her 'Oni-baba', meaning 'demon granny'. She had the twins separated when they were young, in order to try to avoid the curse of twin heirs, also treating Shion badly whenever they meet. Shion suspects that she was the mastermind in Satoshi's disappearance, and accidentally kills her while attempting to interrogate her in Watanagashi-hen and Meakashi-hen. Although she appears to be somewhat of a tyrant, she occasionally shows her softer side such as agreeing to help Satoko when Keiichi stood up to her and is only harsh to keep appearances. She respects him after this and later described him as an interesting young man in Minagoroshi-hen (but warns him that he will be chased around with a sword if he shows up again). Head of one of the Three Families, and the official village chief of Hinamizawa. He seems to be a kindly old man, but is vehement in his hatred for Hinamizawa's enemies. As this includes Satoshi and the rest of the Houjou family, he is killed by Shion in Watanagashi-hen and Meakashi-hen. Rina is a woman who appears in Rena's life in the story Tsumihoroboshi-hen. She is the lover of Teppei Houjou, and together they swindle men out of their money through intimidation and blackmail schemes. Her real name is Ritsuko, but she uses Rina as a fake name. Rena kills her to protect her father. She is killed in Tatarigoroshi-hen, when her body was found in a bag in a storm drain after having been tortured to death by an unknown assailant, in Minagoroshi-hen, when she is murdered by members of the yakuza when she tries to flee Okinomiya, and in Miotsukushi-hen, where she is killed by Takano. Her death often triggers Teppei's return to Hinamizawa. Akane is the mother of Mion and Shion Sonozaki and is the daughter of Oryō Sonozaki, the leader of the Sonozaki household. She attends the council meetings with Oryō and obeys her commands despite the fact that she lost the inheritance of the Sonozaki estate for marrying an outsider. Okonogi is the leader of an organization called the Yamainu. The Yamainu are a group of what are essentially mercenaries, working for the group "Tokyo". They work for Miyo Takano to help her carry out her plan to destroy Hinamizawa, but betray her in the end when things go wrong. Nomura is a mysterious woman who represents "Tokyo"; an organization plotting the whole murder and massacre of Hinamizawa. "Tokyo" members consist of very powerful figures such as governmental and political people. Within this organization, there are three main members who investigate directly in Hinamizawa: Kyousuke Irie, Miyo Takano, and Jirou Tomitake. "Tokyo" has control over a large group of soldiers, known as the Yamainu, whom they lend to Takano. Frederica is an omni-present being surrounding the Higurashi universe. Frederica is the writer of the poem about Rika's struggle to escape the fate of June 1983, giving hints about each arc. She likes playing with time and events, as seen in puzzle piece #52 and the end of the second season of the anime, entering an alternate world and stopping Miyoko's parents from dying. Although she claims that she is not Rika, it's implied that she is the collective mentality of the several thousand reincarnations of Rika. The pronunciation of "Frederica" roughly resembles Rika's name in eastern order, and Bernkastel is well known for its wine. Yukie is Mamoru's wife, and is only seen in Himatsubushi-hen. In that chapter she stays in the hospital while she is pregnant, and, after praying for her husband's safety while he is in Hinamizawa, falls down the stairs and dies, while her child, Miyuki, survives. In the Minagoroshi-hen and Matsuribayashi-hen chapters however, it is revealed in these alternate timelines that Mamoru returned early after heeding Rika's warning, thus preventing her death. "The Beginning (Chapter: Spirited Away by the Demon, Part 1)"
Keiichi Maebara moves to the rural village of Hinamizawa and befriends four girls—Rena Ryugu, Mion Sonozaki, Satoko Houjou, and Rika Furude. He joins their after-school club. Life is peaceful until Keiichi learns from a man named Tomitake about a murder in Hinamizawa's past. He also learns about a dam construction project which had been proposed by the government five years earlier. The project met with protests and was withdrawn. When Keiichi asks Rena and Mion about any incidents relating to the project, they refuse to speak about it, which makes him suspicious. He gets even more suspicious when he finds a newspaper article about the dam project manager being dismembered. He learns that one of the killers is still at large. "The Secret (Chapter: Spirited Away by the Demon, Part 2)"
During the annual Watanagashi festival, Keiichi is informed by Tomitake and a mysterious woman, Takano, about "Oyashiro's curse". A series of murders and disappearances has occurred on the night of the festival for the past four years and are all supposedly caused by the curse of Hinamizawa's guardian deity, Oyashiro. The next day, Keiichi is interrogated by a police detective, Oishi, and learns that Tomitake committed suicide by clawing out his own throat, while Takano has gone missing. He becomes Oishi's informant. Keiichi notices changes in Rena and Mion's behavior and suspects them of hiding something from him. He too is accused of keeping secrets because of his ties to Oishi. Keiichi delves deeper into the history of the curse with Oishi, and learns that one of the victims was Satoshi, a boy who had apparently transferred out of school in Hinamizawa before Keiichi arrived. At that point, Keiichi realizes that Rena has been eavesdropping on him the whole time. "Suspicion (Chapter: Spirited Away by the Demon, Part 3)"
Growing increasingly paranoid, Keiichi calls in sick for school to avoid his friends and delve deeper into the mysteries of Hinamizawa. Oishi takes Keiichi to Angel Mort for lunch, and he tells him that all of the victims of Oyashiro's curse are connected to his group of friends. That night, Rena and Mion visit Keiichi and give him a box of ohagi as part of a club activity, which all contain a needle. Keiichi is convinced that Rena and Mion are out to get him. Keiichi arms himself with Satoshi's baseball bat when he returns to school the next day. His friends reveal that Satoshi had displayed similar paranoid behavior before he disappeared. "Disturbance (Chapter: Spirited Away by the Demon, Part 4)"
Rena pays Keiichi a visit, attempting to bring him dinner, and begins acting strangely, intimating that she has been monitoring him inside his home, prompting Keiichi to succumb to his paranoia and slam his front door on her hand. Distressed by Keiichi's behavior, Mion attempts to apologize for keeping so many secrets about Hinamizawa from him, but he coldly rebuffs her. Later, Keiichi is being followed by Rena, carrying a machete. He demands to know who caused all the murders and disappearances; Rena simply replies that it is all the work of Oyashiro. Keiichi escapes from Rena and finds himself being chased by a mysterious group of men, who knock him out. When he awakens in his room, he is attacked by Rena and Mion, who attempt to inject him with a syringe. In self-defense, Keiichi beats Rena and Mion to death with Satoshi's bat. He calls Oishi and tells him the murders were caused by Oyashiro, and then Keiichi, who is sure that Oyashiro is behind him, claws out his own throat. The next day, Keiichi is found dead. The police also find the bodies of Mion and Rena, and they find out that Keiichi was the one who killed them. The syringe that Mion used, which Keiichi attempted to hide in a wall clock, has also been removed. "Jealousy (Chapter: Cotton Drifting, Part 1)"
The timeline of the last four episodes has been reset. Keiichi discovers Mion has an identical twin sister named Shion. Keiichi also discovers that Mion has a crush on him, and so does Shion. Keiichi wins a doll in a competitive game, which he gives to Rena, implying to Mion that she's too masculine for it. Mion awkwardly brushes it off, but is visibly upset. "Takano (Chapter: Cotton Drifting, Part 2)"
Keiichi learns about the curse of Oyashiro. During Rika's ritual performance at the Watanagashi festival, Shion whisks Keiichi away to sneak to the ritual tool shed of Oyashiro, where Tomitake and his friend, Miyo Takano, are waiting. Tomitake stands guard while the others look inside. They find dozens of torture tools. Takano explains the significance of the ritual tool shrine and the Watanagashi festival. Her theory is that the villagers of Hinamizawa are continuing an age-old tradition of sacrificing people to Oyashiro. Shion and Keiichi promise not to tell anyone they entered the shrine. Keiichi becomes disturbed when he is questioned both by Mion and Detective Oishi about the whereabouts of Shion, Tomitake, and Takano on the night of the festival. Keiichi learns from Shion that Takano was found burned to death and Tomitake committed suicide by clawing out his throat. Keiichi starts to wonder about Shion's safety as well as his own. "Lies (Chapter: Cotton Drifting, Part 3)"
Rika shows knowledge of Keiichi's actions on the night of the festival, and in a metaphorical conversation promises to help the 'little kitty cat who did something bad' on the night of the festival by making the 'big dogs' aware the 'kitty cat' had no bad intentions, and alludes to the fact that Mion is angry with Shion over what happened. She also warns Keiichi that if the same 'dog' who bit the village leader tries to bite him, he should tell her. That night Keiichi learns the village leader has gone missing. Shion tells Keiichi that she confessed to the village leader about what they did. Shion thinks it's her fault that Oyashiro's Curse got him because he had promised to help them. Keiichi believes Rika is also in danger. Keiichi, Rena and Mion go to Rika and Satoko's home to find them, but they have gone missing. Keiichi talks with Detective Oishi. His account of the village leader's activities before disappearing contradict Shion's claim that she confessed. Shion has been missing ever since the festival. Shion calls Keiichi that night, and he confronts her about who she really is. He hears maniacal laughter before she hangs up the phone. "Wish (Chapter: Cotton Drifting, Part 4)"
Keiichi and Rena suspect that Mion is behind Rika's and Satoko's disappearance, and inform detective Oishi. Keiichi and Rena confront Mion at her house because the police don't have enough probable cause for a search warrant. Mion admits that Rika and Satoko came over to her house the night they disappeared. She asks to have a private talk with Keiichi before the police arrest her, and she lures Keiichi to a torture chamber. He sees Shion in the dungeon before Mion knocks him out. Mion prepares to torture Keiichi, but stops after Keiichi, believing Mion to be possessed by the demon Oyashiro, begs Mion to spare Shion and to return Mion's body to her. Mion, baffled, asks whether he wants to be spared as well, which Keiichi says is irrelevant compared to Shion's safety. Mion hears a noise and assumes Rena brought the police and tasers Keiichi unconscious. Keiichi and Shion are rescued from the torture chamber and Mion escapes. Keiichi is visited by Mion who stabs him in the stomach. He is gravely wounded and taken to hospital. Keiichi learns Shion has fallen to her death from her apartment. Oishi asks Keiichi if he was certain it was Mion Sonozaki that attacked him. He confirms it. Oishi reveals Mion's body was found dead at the bottom of the well the same day Keiichi and Shion were rescued. Oishi also reveals Miyo Takano, who was burned to death on the night of the festival, had actually died 24 hours beforehand. After Oishi leaves, Mion appears and presumably kills Keiichi. "Older Brother (Chapter: Curse Killing, Part 1)"
Once again, the timeline of the last four episodes has been reset. Keiichi's parents leave for Tokyo for a few days. Helped by Satoko and Rika, who make dinner for him, Keiichi learns about Satoshi, Satoko's older brother, and his mysterious disappearance on the night of last year's Watanagashi festival. He decides to act as a surrogate brother to Satoko and investigate Satoshi's disappearance. "Bond (Chapter: Curse Killing, Part 2)"
When Satoko is absent from school for a few days, Keiichi discovers that it is because of Teppei, her abusive uncle. He left Hinamizawa after his wife was murdered on the night of last year's Watanagashi festival, and has only just returned to town. Keiichi intervenes. "Borderline (Chapter: Curse Killing, Part 3)"
Keiichi decides that he must kill Teppei. He asks Mion to take Satoko to the Watanagashi festival. When she asks him why he tells her he has some things to do. Mion mentions that is exactly what Satoshi said and did before he disappeared. Keiichii concludes that Satoshi must have killed his aunt to protect Satoko and that he must do the same. He beats Teppei to death with Satoshi's baseball bat and buries the body. On his way back home, Keiichi bumps into Takano, who appears to know of the murder he committed when she asks him if he buried the body. "Lost Item (Chapter: Curse Killing, Part 4)"
Keiichi is shaken when his friends tell him that he was actually at the Watanagashi festival with them. Satoko's uncle is still abusing her, though Keiichi thought he had killed him. He goes to the Doctor's office, where he confesses the murder to Coach Irie. Although Coach Irie promises to help him, he overhears him talking to his assistant with preparations to put sedatives in the tea they were going to give him. Keiichi flees to go check up on the location of the body. Oishi surprises him there and forces him to keep digging the hole, where Keiichi becomes confused when the body is nowhere to be found. "Apology (Chapter: Curse Killing, Part 5)"
Keiichi goes to the Houjou residence to ascertain Teppei's status and finds Satoko in the bath and in need of medical help. Keiichi takes Satoko to the clinic, but finds that Coach Irie committed suicide and that Oishi is missing. Satoko requests that she go pick up some clothes from Rika's house since she's only wearing a bath towel from earlier. At the Furude Shrine, Keiichi discovers Rika's disemboweled body. Satoko believes that Keiichi is the culprit and flees, concluding that he is possessed by Oyashiro. Keiichi fruitlessly tries to convince her otherwise, and Satoko pushes him off a bridge. Keiichi wishes that everything in the village dies, and soon after, disaster strikes the village of Hinamizawa: poisonous volcanic gas from the Onigafushi swamp gushed out, murdering the entire populace. Keiichi survives the fall from the bridge and the gas leak, and it is later found out he is the sole survivor of the gas leak. "Hinamizawa (Chapter: Time Wasting, Part 1)"
Four years ago, during the dam incident, young police investigator Mamoru Akasaka comes to Hinamizawa to investigate a kidnapping of the missing child Toshiki Inukai, who is the grandson of the dam's construction project. He meets Oishi who tells him about the Dam Project Opposition Committee and the 3 leading families of Hinzamizawa. He pretends to be a tourist to get a tour of Hinamizawa where he meets the younger Rika Furude. At the Furude Shrine an enigmatic Rika warns him to leave Hinamizawa and go back to Tokyo. She collapses but commences to act normally afterward. A colleague of Oishi gives intel to Akasaka about the Dam Project Opposition Committee, headed by the Sonozaki family leader, Oryō. We learn that they have abducted the missing child and that a novice police investigator was dispatched to Hinzamizawa from Tokyo. She has given orders to "take care" of him if he begins to meddle too much into their affairs. The following day Oishi informs Akasaka that they have found the wallet and other identification items of the missing child in a deserted village called Takatsudo and has agreed to accompany Akasaka there. "Sign (Chapter: Time Wasting, Part 2)"
"First Love (Chapter: Eye Opening, Part 1)"
The events from Watanagashi-hen are retold from Shion's point of view. For generations the Sonozaki family has murdered the younger of newborn twins as they are seen as bad luck. When Mion and Shion are born, they decide to send Shion away to boarding school. Shion escapes and returns to Hinamizawa with the help of her caretaker, Kasai. Shion, wanting to live on her own, pretends to be her sister and gets a job at their uncle's shop, with Kasai and Mion supporting the illusion. Shion learns about Oyashiro's curse from Mion and the mysterious deaths. Shion meets Satoshi, a classmate of Mion's, who mistakes her for Mion. Shion takes a liking to Satoshi. Satoshi is a member of the Houjou family, and his parents were victims of Oyashiro's curse for supporting the construction of a dam that would have flooded the town. Satoshi and his younger sister, Satoko, were taken in by their aunt and uncle after their parent's death. Their aunt and uncle resented them because the rest of the village shunned them for their parent's support of the dam. Shion goes to school in Mion's place to try to cheer up Satoshi. When she fails she takes out her anger on Satoko, who she sees as the root of Satoshi's problems and beats her up. Rika and Rena try to stop her until Satoshi finally comes in and shoves Shion out of the way. Shion learns Satoshi despises the Sonozaki family for having persecuted the Houjou family. "Responsibility (Chapter: Eye Opening, Part 2)"
Satoshi apologizes to Shion (still pretending to be Mion), and asks her to care for Satoko during the Watanagashi festival, and presumably murders his aunt the night of the festival for abusing Satoko. Shion is suspicious that he is the culprit, but provides an alibi for him when detective Oishi questions him. In the process she reveals that she isn't Mion, but her twin sister Shion. Shion's family finds her when Oishi checks out her story, and she is taken back to their family estate to answer to her grandmother for the trouble she has caused. There, in the underground torture chamber, she insults the family name by proclaiming her love for Satoshi. Mion orders her to ask for forgiveness for what she has done and that Kasai and their uncle, who reside in the next room, will be spared. Shion submits, and Mion takes out a de-nailing torture device. Shion is forced to de-nail herself for her crimes against the family, but can only de-nail her left pinky nail. Sonozaki henchmen step in and de-nail the rest of her left ring and middle finger nails for her. The following day Oishi meets her at the toy store where she finds out that Satoshi got the toy for Satako, and takes her into the station for question. He explains that the previous day, Satoshi has gone missing and Kasai explains they have caught the aunt's murderer, a cocaine addict. "Oni's Blood Line (Chapter: Eye Opening, Part 3)"
Shion finds out Satoshi has gone missing and decides to investigate further into the mysterious murders over the past four years. She meets Takano at the library. Takano tells her more about the history of Hinamizawa and its dark past. She explains that Hinamizawa used to be called Onigafuchi and that, according to the Shrine God's Sacrifice Ritual, for each victim sacrificed, there must be an equivalent number of missing people. Takano also mentions that according to the sacrifice ritual, the missing people would have to sink to the bottomless Onigafuchi marsh, which leads Shion to believe Satoshi's body might be there. After Shion's encounter with Takano, she is visited by Mion at her apartment where she learns that Mion de-nailed herself in the same spots Shion had, after she had left, because she didn't want Shion to take all the burden. The story skips ahead one year to the present right before the Wataganashi Festival. Keiichi brings back memories of Satoshi to Shion. The story further skips to forward to where Tomitake, Takano, Keiichi, and Shion enter the shrine. After the festivities, Shion is caught listening to Mion and her grandmother as they discuss the events that have transpired over Takano and police investigations. "Revenge (Chapter: Eye Opening, Part 4)"
Shion believes the Sonozaki family is connected to the acts of "spiriting away" people in the village, especially in the case of Satoshi. Enraged, she tasers and imprisons Mion in the dungeon and unintentionally kills her grandmother after tasering her as well, dumping her body down a well used for corpse disposal in front of Mion, repeatedly accusing Mion of having been implicit in Satoshi's murder. Shion pretends to be Mion the next day and confronts Keiichi about the previous night's encounters, which Keiichi still denies. Posing as Mion, she attends a village council meeting and lures the village head to the estate, and tasers and captures him after he reveals that her "Distinction" (when she had her fingernails removed) was so she Kasai, her uncle, and Shion herself would not be killed, confirming for Shion that Mion and her grandmother did have Satoshi killed. "Cold Hands (Chapter: Eye Opening, Part 5)"
Shion tortures the village head for information about the previous murders and Satoshi. Shion confronts Rika about the murders, leading to a confrontation between the two after Rika shows up with an empty soy sauce bottle. Rika sprays Shion with pepper spray, but Shion tasers Rika and injects Rika with the syringe that Rika had brought for her. Rika commits suicide by stabbing herself repeatedly in the head after Shion threatens to torture her. Shion invites Satoko to her house. "Condemnation (Chapter: Eye Opening, Part 6)"
Shion tricks Keiichi in a phone call and later tricks the townsfolk into believing Keiichi a murder suspect. She quickly realizes that Oishi suspects her instead. She brutally murders Satoko, whom she has been holding captive as punishment for Mion. Then she remembers to her horror that one of Satoshi's last requests was to keep Satoko safe. This drives her deeper into madness. The following day, Keiichi and Rena suspect "Mion" to be the Rika and Satoko's killer. Shion then lures Keiichi to the dungeon and prepares to torture him. Keiichi begs Shion, whom he believes is Mion possessed by Oyashiro, to spare Shion and Mion, which drives Shion to tears, and she tasers Keiichi. Shion frees Mion, switches clothes with her and takes her to the body disposal well, telling her that Satoshi's body is down there. Mion tells her that their grandmother approved of her relationship with Satoshi, but Shion refuses to believe her. Shion tases Mion again causing her to fall in the well. She and Keiichi are rescued. Following the incident, Shion starts to hallucinate. She visits Keiichi and gravely wounds him. Shion hastily returns to her apartment by scaling the side of the building, and slips and falls to her death. As she falls, she imagines seeing Satoshi's face in the moon, and apologizes to him before she hits the ground. "Happiness (Chapter: Atonement, Part 1)"
The chapter starts off with a heated water-gun competition between the gang. Keiichi heads off with Mion and headshots her. Being the brilliant strategist that she is, Satoko has sabotaged Rena's hidden water-gun backup, but Rena smashes it against the wall using the water in the handle to splash Satoko. In a one-on-one dual, Rena and Keiichi end up tieing the game, both becoming victors. Mion, Satoko, and Rika must work the day at the Angel Mort Cafe, owned by Mion and Shion's uncle, as their Punishment for losing. There Rena meets her father's girlfriend, Ritsuko, or Rina for short. After the day's end, Rena heads deep inside the landfill to an abandoned and half buried motor-home. She has a flashback of when she was living with both her parents; we learn that she had a conversation with her mother asking her, if they were to split up, which parent would she want to live with. When her mother informs her she plans on leaving her father to marry another man, and that she is pregnant with his child, Rena abhors the very thought and jumps forward to Rena breaking piled furniture and other junk outside her house. Back at home, Rena learns that Rina has helped her dad completely redo the entire living room, throwing out other things, including Kentak-kun. The next day at a cafe, Rena sees Rina together with Houjou Teppei. From overhearing their conversation and the information she gets from Shion and Kasai, she learns that they make their living from the 'Badger Game', a series of blackmailing where a woman gets together with a man. Then the real 'partner' of the woman steps and reveals himself to make the man pay them money. This is what Rina plans on doing to Rena's father and Rena's plan for revenge begins to emerge. "Place to Return (Chapter: Atonement, Part 2)"
Rena returns home and goes through her father's checkbook only to find out that he has recently charged a lot of money on his cards and has withdrawn a lot of money from his accounts. After school, Rena heads home to find Rina there and heads back to the landfill to have Rina follow her. Deep within the landfill at the half-buried motor-home, Rina asks Rena if she likes her because there might be a future for her and her father, and that she is also pregnant. Rena straightforwardly confronts Rina that she knows about her and Teppei's plan. Furious, Rina attempts to strangle Rena to death but Rena finds a shard of glass nearby and slices Rina's stomach open. As Rina hunches over on the floor in agony, she begs for her life before Rena brutally bashes her head in with a large pipe. Rena shoves her corpse into an old fridge and returns home. As she nears her house she sees Teppei savagely beating her father outside their house and tells him he'll be back tomorrow to pick up the money. Rena catches up to him and tells him Rina wants to have a private chat with him, so she leads him to the land fill. When her flashlight goes out, she quickly appears behind Teppei and slices his head in with a giant machete-like weapon that she is seen holding in the intro. Rina dismembers both of their bodies and wraps them up in small gift-like packages only to have the gang find her in the act. Indubitably, they try to console her and accept her for who she is. Keiichi tells her, as friends, they will keep it a secret and help her dump the separated bodies into a small cave in the woods. When Rena leaves, Mion tells the rest of them to not mention this incident so that they'll all eventually forget about it. At the end, they're all at the Watanagashi festival and Oishi is in the background glaring at them all. "Document 34 (Chapter: Atonement, Part 3)"
While studying Takano's scrapbooks, Rena discovers that Oyashiro, who is worshiped by the Three Families that run the village, doesn't actually exist. She discovers that the problem is a virus that causes its victims to go berserk. In addition, since the altitude and temperature are very specific for the survival of the virus, it is explained that this is what causes the victims to feel "homesick" when they leave Hinamizawa. This disease caused all the murders. As a result, she is being hunted down by people who appear to stop at nothing to keep this information a secret. "Earth Invasion (Chapter: Atonement, Part 4)"
Rena learns that Mion moved the bodies from where they originally hid them. Rena's faith in her friends is shattered and she begins to go insane. Keiichi tries to stop Rena, but she confronts him with his own dark secrets. He confesses his past sin to his friends, and finds that he can recall events from Onikakushi-hen, particularly his own paranoia and murder of Rena and Mion, as it is revealed that Mion was planning to draw on Keiichi with a marker, rather than give him an injection, the final event before he killed them. Rika reacts thunderstruck at this, and later tells Keiichi that no one else remembers his murder except her, and she forgives him. This strengthens his understanding of Rena's situation and he resolves to prevent such tragedies from occurring again. He apologizes to Mion, who is understandably uncomfortable and baffled by this. "Retake (Chapter: Atonement, Part 5)"
With her madness at its peak, Rena holds her friends and schoolmates hostage and threatens to kill them all with a homemade bomb planted on the roof of the school. Working together with the police and his friends, Keiichi defuses the bomb. Keiichi and Rena have a final confrontation on the roof, Keiichi armed with Satoshi's bat and Rena with her cleaver. Rena gradually regains her sanity until she defeats Keiichi, though she is unable to bring herself to kill him. Rena reconciles with her friends. Though tragedy has been averted through Rena's atonement, the constant time loops have yet to lift; however, there is now hope for the future. ↑ 1.0 1.1 1.2 1.3 1.4 1.5 1.6 1.7 1.8 07th Expansion (December 15, 2009). Higurashi When They Cry. PC. MangaGamer. This page was last edited on 28 May 2017, at 03:12.